Experiencing good days with good friends since 1986! The Goodwill Day Services programs support seniors and adults with developmental disabilities to maintain independent and active lives in their community. 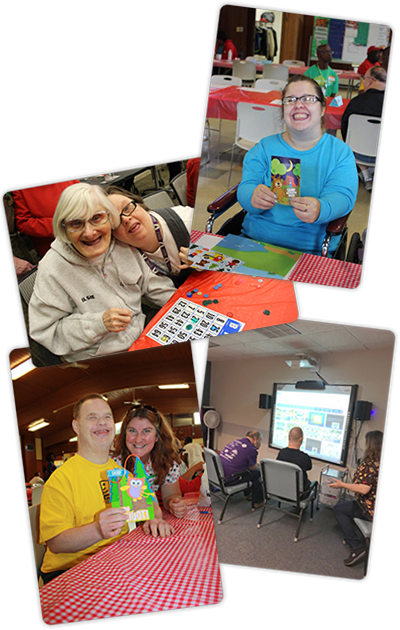 Goodwill operates three centers that develop and provide activities based on individual interests and needs. Our participants may choose from a variety of opportunities to maintain life skills including recreational or social activities, music or arts appreciation, educational or volunteer opportunities and activities to strengthen and maintain physical health. We also offer a wide variety of community outings every month. This personalized, engaging approach provides a foundation of skills, self-confidence and independence to maintain happiness and health and prevent institutionalization. Recreation and social activities such as playing cards, enjoying sports or exercise, arts and music appreciation, dances, using computers, and spending time with friends. Supportive learning environment with opportunities to experience new activities while maintaining present abilities in communication, academics, self advocacy and independent living. To be eligible for services you must be 18 years of age or older and:. Looking for program options that include a variety of recreational, educational, or social activities. Need only minimal supports with daily living skills. Does not pose any safety risks to self or others. Funding Sources: Family Care, IRIS and Private Pay. To Make a Referral: Call the Goodwill Intake Coordinator at (855) 455-1110. While hours of operation vary slightly by location and service, most Day Service programs operate Monday through Friday between the hours of 8:00 AM to 4:00 PM.